Forget the silly name — Pyragon? Really? This is a toy gun we're talking about here. 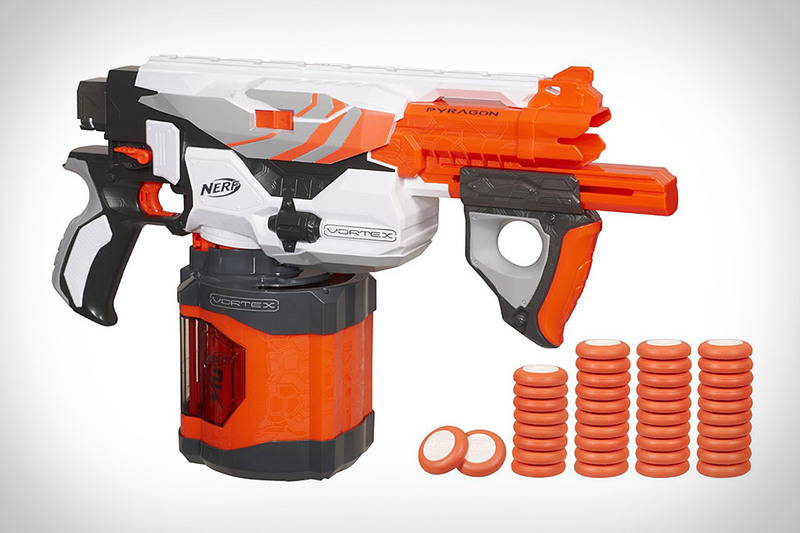 Anyway, the Nerf Vortex Pyragon Blaster ($35) looks to satisfy your — or your offspring's — insatiable thirst for more ammo. Thanks to an enormous magazine, this piece of plastic weaponry can fire off up to 40 discs without reloading, and offers a "Slam-Fire" handle that lets you fire off multiple rounds while you hold down the trigger. 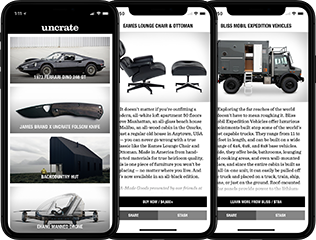 Probably not the best for covert missions, though — with an oil filter-like magazine, your co-workers are sure to see you coming. Ditch the toys and step up to a man-sized R/C with the Mammuth Rewarron 1:3 Scale R/C Car ($5,500-$15,000). As the name suggests, it's one-third the size of a real auto, measuring nearly six and a half feet long, and weighing roughly 175 lbs. It's powered by a 200 or 250cc 4-stroke engine, giving it a top speed of over 40 mph. It also boasts an on-board touch screen controller for the brakes, ABS, traction control, and telemetry. All of which begs the question: Why not just buy a real car instead? Office warfare has never tasted so good. The Marshmallow Mazooka ($33) is your new long-range weapon for cubicle-based conflict, capable of launching large marshmallows distances of up to 40 feet with the touch of a trigger. Thanks to a battery-powered air pump, you won't have to manually build up the pressure needed to fire — just pull the barrel forward, load the marshmallow, slide the barrel back, aim, and shoot. Funny cars are known for their incredible power, speed, and, well, funny looks. Now you can recapture the feeling of a real drag race in your driveway with a Traxxas R/C Funny Car ($530). Available in four different authentic driver editions, these advanced remote control cars feature ET-3s brushless power systems and tilt-up bodies developed from the full-size CAD drawings, including a tube-style chassis. On the TQi 2.4GHz remote, you'll find tuning features like steering and throttle sensitivity adjustments, braking strength controls, a toggle for Burnout, Staging, and Race modes, and a Launch Control switch that lets you hold down the throttle and go. All that's missing is the smell of racing fuel and a parachute to slow you down. The problem with some Lego sets is once they're built, there's not much you can do with them — the more elaborate the set, the less sturdy it seems to be. Unless you're talking about this Lego Technic 4×4 Crawler ($200). Clocking in at 1,327 pieces, this beast features motorized 4-wheel steering and 4-wheel drive, opening doors, an "extreme" suspension, and a remote control that communicates with the included servo via IR. Take that, stationary Star Wars set. Ever wish you could have an action figure for your favorite movie characters that fall outside the realm of kid-friendly films? Like, for instance, Travis Bickle, Michael Myers, or Mad Max? Now you can. These Custom Movie Action Figures ($20-$70) are mostly custom-made and come in custom packaging that looks like something you'd buy in a store. In addition, some of your favorites that actually do have figures — like Indy and Darth Vader — get new packaging that makes it appear as if they'd been culled from the ranks of GI Joe. Perfect for decorating the ol' home theater entrance. Yes, you read that correctly. The Puzzlebox Brain-Controlled Helicopter ($250) lets you control a floating orb using nothing but your brain power. The package includes a NeuroSky MindWave Mobile EEG headset, a Pryamid that serves as a home base and remote control, and the Orbit helicopter/orb itself. Simply select a flight path, slide on the headset, and focus — the software in the Pyramid will interpret your levels of concentration and relaxation and move the helicopter appropriately. A perfect gift for the sci-fi geek on your list.